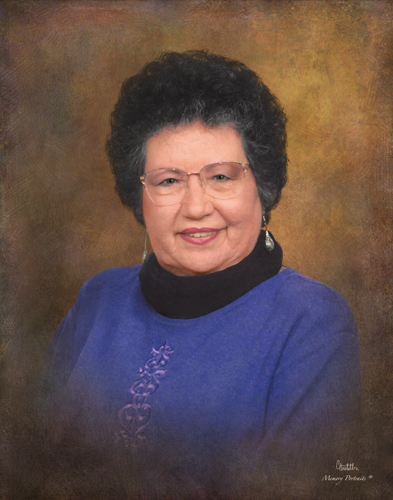 Patsy Cowan, 82, went to be with the Lord on April 12, 2019. Patsy was born on August 24, 1936, to Leslie & Dorothy Phillips Sr. in Luling, TX. Patsy is preceded in death by her parents: Leslie & Dorothy Phillips Sr. of Ingleside, TX and grandson: Jacob Brymer of Portland, TX. Left to cherish her memory are her husband of 64 years: Pastor Lewis N. Cowan Sr. of Ingleside; son: Lewis Cowan Jr. (Pam) of Manvel, TX; daughters: Rachel Cowan DeBerry (Mark) of Portland, TX, and Leslie Cowan Kemp (Clayton) of Ingleside, TX; brothers: Leslie C. Phillips Jr. (Pat) and Hughes H. Phillips (Betty); sister: Sandra Phillips Morris Stephens (JB); seven grandchildren, nine great-grandchildren and numerous nieces and nephews. Patsy graduated from Ingleside High School and Durham Business College. She was married at the age of 18. She was a Pastors wife for over 62 years. Through her early years worked as a secretary for several local businessmen, The City of Corpus Christi, surgical ward clerk in M.D. Anderson and as the receptionist in another hospital. She was a wonderful mother, grandmother, and great-grandmother. As a pastor’s wife, she taught Sunday school for various age groups and many Bible studies. She counseled and discipled many women and assisted in all aspects of the church ministry. She was a great prayer warrior and had hundreds if not thousands of her prayers answered. She wrote several songs and poems that are cherished blessings to many. Visitation will be 12:00 p.m. – 9:00 p.m. Wednesday, April 17, 2019, at Charlie Marshall Funeral Home in Aransas Pass. Funeral Service will be 2:00 p.m. on April 18, 2019, at Ingleside Church of the New Testament located at 2508 Church St in Ingleside, Texas 78362. Christian Burial will follow at Prairie View Cemetery. In lieu of flowers please make donations in her memory to Ingleside Church of the New Testament at 2508 Church St. in Ingleside, TX. 78362 or Christian Charity of your choice.